KIMEP University always strives to highest standards of educational quality. KIMEP University is involved in the accreditation process and participation in national and international ratings. 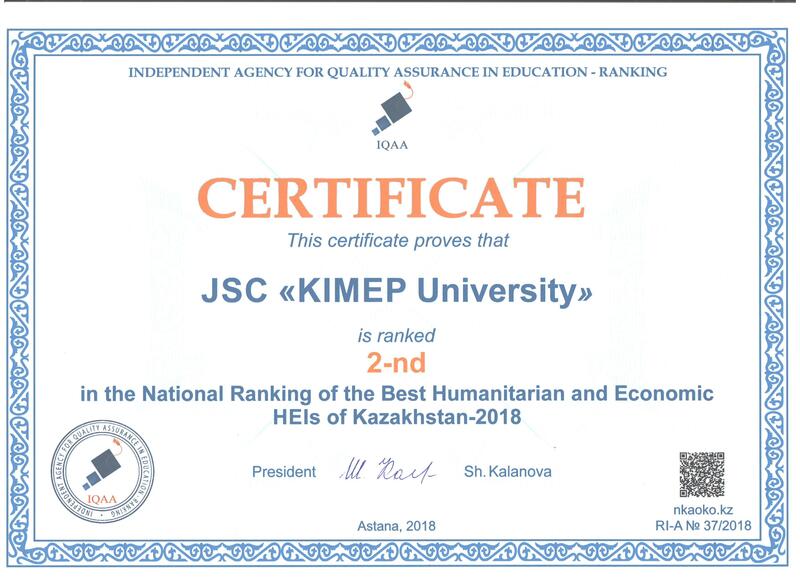 KIMEP University is recognized by the Independent Kazakhstan Quality Assurance Agency as the best university in the category of humanitarian-economic universities. 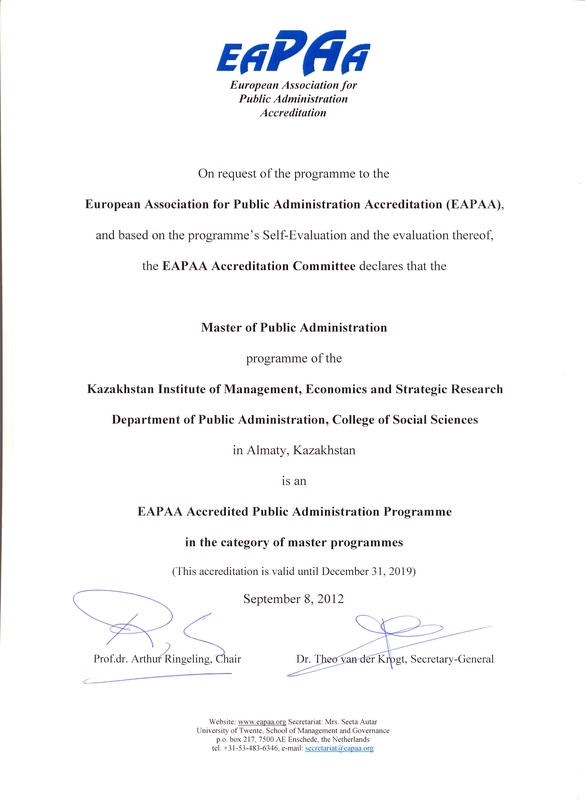 In 2013 all KIMEP University undergraduate and graduate programs received international accreditation from Agency for Quality Assurance and Accreditation Austria (AQAA Austria). – ‘Knowledge Transfer’ for financial input from delivering Continuous Professional Development courses and training. – Research and Research Linkages Ranking. 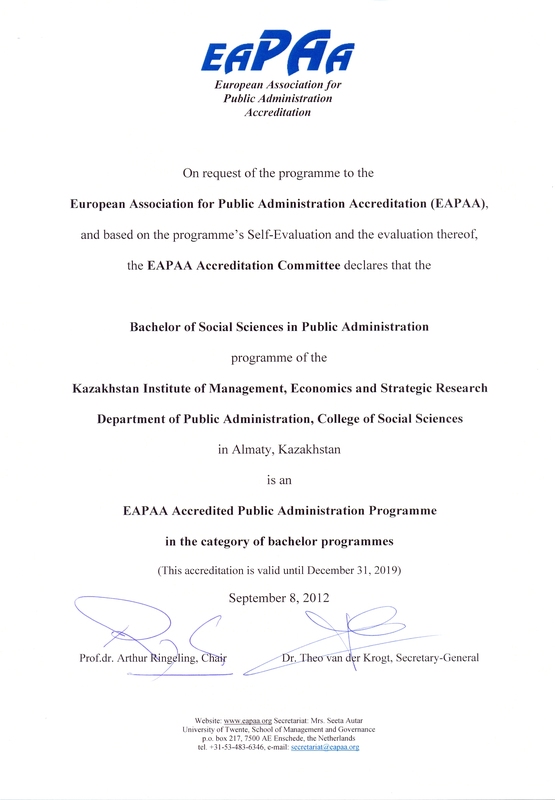 Agency for Quality Assurance and Accreditation Austria (AQAA Austria, https://www.aq.ac.at/en) – Is authorized by the European Union to accredit academic programs in the European Higher Education Area – Itis one of 4 international accreditation agencies recognized and listed in the National Register by the Ministry of Education and Science of the RK – Holds full membership in European Association for Quality Assurance in Higher Education, Central and Eastern European Network of Quality Assurance, Agencies in Higher Education, International Network for Quality Assurance Agencies in Higher Education and European Consortium for Accreditation. Date: January 2018 – January 2023 Independent Agency for Quality Assurance in Education (IQAA, http://iqaa.kz) – Established in 2008 – The mission is to raise the competitiveness of HEIs of RK on national and international levels of accreditation and academic ranking. Date: July 6, 2018- July 5, 2023 Foundation for International Business Administration accreditation (FIBAA, http://www.fibaa.org ) – The purpose is to promote the quality and transparency in education and science by awarding quality certificates to educational programs and education institutions in the areas of higher education and continued professional development – Is internationally networked and works closely within the framework of international bodies to enhance the comparability of quality standards and quality. Date: April 2013 Asian Forum on Business Education (AFBE, http://www.afbe.biz/main/) – Established in 1992 as a mutual self-help group of business schools in or interested in Asia – Member of the Asia-Pacific Quality Network, supported by the World Bank and UNESCO. KIMEP University Department of Journalism & Mass Communication Bachelor’s and Master’s Programs accredited for the full five year period beginning January 2014 and expiring December 2018. Bang College of Business: Member of the Association to Advance Collegiate Schools of Business (AACSB International, www.aacsb.edu ) , AFBE (http://www.afbe.biz/main) and American Chamber of Commerce (www.amcham.kz).